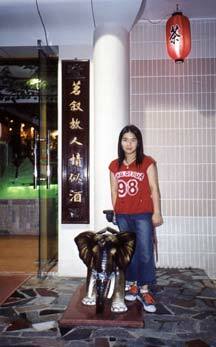 Caizhen Li outside a restaurant in Canton during her return to China this past summer. I went back to China this summer with my parents, my brother, and some relatives. There were 13 of us. 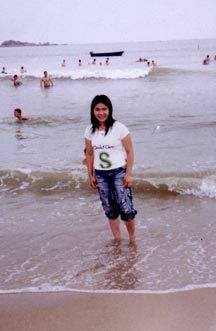 We went because we still have a lot of relatives in China and we have been away for five years. It was a surprise for them. My family bought the tickets in April but we didn't tell anybody in China. We thought if we told them, they would feel nervous and concerned about us and wouldn't go to sleep well. Before we were to go, a very dangerous thing happened in China. It was called "SARS." SARS is an extremely awful disease. It affected a lot of people. People who have this kind of disease feel exhausted and not in a good mood. They feel so sleepy and their eyes feel dreadful. It was easy for the disease to pass to other people. The disease killed many people. People in Hong Kong and in Beijing were afraid. "Even the people in Hong Kong and in Beijing wear masks whenever they go out," one of my relatives said. During that month of SARS, the prices of the airplane tickets decreased because all of the people were afraid to go to China. My family and I were very curious about SARS and wondered if that would affect us. At first my family and I decided not to go in the summer because a lot of flights were canceled. But finally a month later, we heard the SARS was over, so we changed our minds, and at the end we decided to go. When we arrived at Hong Kong airport, my uncle and his friends came to pick us up. I was so happy to see my uncle. After we were done with all the important things, like the passports and getting the suitcases, we took the bus to my uncle's car. On the bus there were a lot of forms for us to fill out about our health. We arrived at the city at 4:00 in the morning. We went to a hotel instead of going home. We lived at the hotel for two days. We ate at a restaurant and my uncles, aunts and my cousins came over. After breakfast on the second day we bought some food and we went to my family's house near the hotel. Some of my neighbors were very surprised. They said, "Am I dreaming or what?" some people said. "We are so excited to see you and we missed you." I was so happy to see my grandma because she took care of me when I was younger and she is very nice. I went to call my friends. They didn't believe I was really there. I couldn't recognize most of the people. They looked different. They were taller and they were skinny. Also of their attitudes, the way they acting, spoke, was different. On the other hand, I could recognize all my cousins, and uncles and aunts and some of older people but people didn't change that much. The food tasted so good. It was so cheap my family and myself always went out to eat with my relatives and some of friends and neighborhood. Also we loved to go out at night. It was very crowded at night and it was cool out there. I hung out with my family and my friends. We had plenty of activities to do. For example we walked around the stores, rode bikes around the Stone Mountain, went fishing, watched my friends play volleyball, and had fun at the Karaoke. When we went home it was close to 2 or 3 a.m. The time was very different from America. Caizen at a beach not far from her home.